This is the conclusion of ITBusiness.ca’s two-part ‘Broken Telephone’ feature story. Read part one here. Who’s responsible for buying the list? Canada’s national Do Not Call List (DNCL) has man built-in exemptions. But who’s exempt from subscribing to the list and who’s not isn’t always so clear cut. That’s what Eran Hurvitz discovered when his call centre had a dispute with a client. Toronto-based Starford International Inc. was conducting telemarking services on behalf of telecommunications company Comwave Telecom Inc. up until February 2010. That relationship was severed when Comwave refused to pay for the DNCL subscription, saying that Starford should pick up the tab instead. Trying to resolve the dispute was confusing, Hurvitz recalls. Tell us about your experience with the Do Not Call List in the comments section, on our Facebook Page, or on Twitter with the #dncl hash tag. According to the Canadian Radio-television and Telecommunications Commission’s rules, telemarketing firms making calls only on behalf of clients do not require to be registered with the national list, or to subscribe to it. That is the responsibility of the client. Still, telemarketers must ensure its clients are doing this properly, Rosen says. 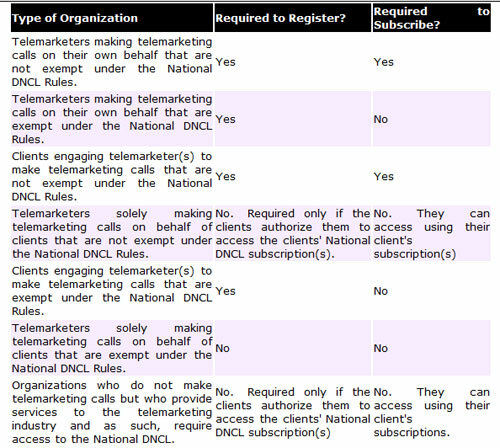 A CRTC table shows who must register and subscribe to the DNCL. Starford eventually did receive a citation from the CRTC, a fact that Hurvitz was unaware of until informed by ITBusiness.ca. But he did correspond with the CRTC over the alleged rules violation in August, and says that a technical problem relating to VoIP resulted in the citation. Starford transferred the line to another company owned by Hurvitz, Wisdek Corp., but Hurvitz believes his VoIP provider did not properly switch the caller ID information on the line to reflect the change. The CRTC does an investigation when it receives a complaint, Rosen says. It involves asking the company named in the complaint for the numbers they called, and matching them against the DNCL. Then it’s determined if an exemption can be claimed – such as a pre-existing business relationship within 18 months – or not. The complainant’s phone records are checked to confirm they did receive the call, Rosen says. Finally, the CRTC enforcement staff decides if a penalty or citation should be issued on the matter. After that, the business has 30 days to contest the violation, and make its case to a three-member panel of the commission that reviews the information put forward by the firm. The CRTC is offering to help small businesses confused about compliance with DNCL, Rosen says. There are staff ready to give guidance on how to follow the fulres. “We have an open door policy here,” she says. But Pinassi doesn’t feel the CRTC officer he dealt with regarding Parkway Motors was helpful. It wasn’t clear what information his company could provide to show they were in compliance, he says. “We weren’t in violation then, and we continue to maintain our database now,” Pinassi says. The dealers’ call centre uses Reynolds & Reynods ERA Dealership Management System to track its internal DNCL, which is mandated for all Toyota dealerships in Canada. The software clearly displays whether each contact stored will accept phone calls or not. Pinassi couldn’t prove his company’s innocence because its call records didn’t reach far back enough to cover the time of the complaint. But he still believes the complainant never did receive a phone call. “The onus was immediately put on our organization to prove this was not the case,” he says. Today, Parkway Motors remains on the CRTC’s public list of companies cited.